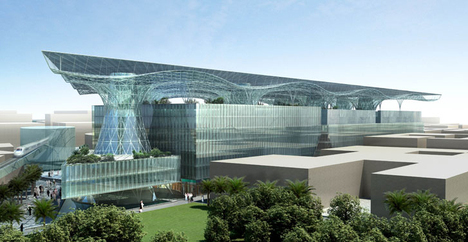 Solar-powered Masdar Institute by Foster + Partners unveiled in Abu Dhabi. Masdar Institute of Science and Technology, the first building to be fully operational within Masdar City in Abu Dhabi and the first building of its kind to be powered entirely by renewable solar energy, has been officially inaugurated. En er staat een mooie animatie op de site van de architecten zag ik.